A Quick Guide To Service Aircraft Markings Of The Cold War Period. 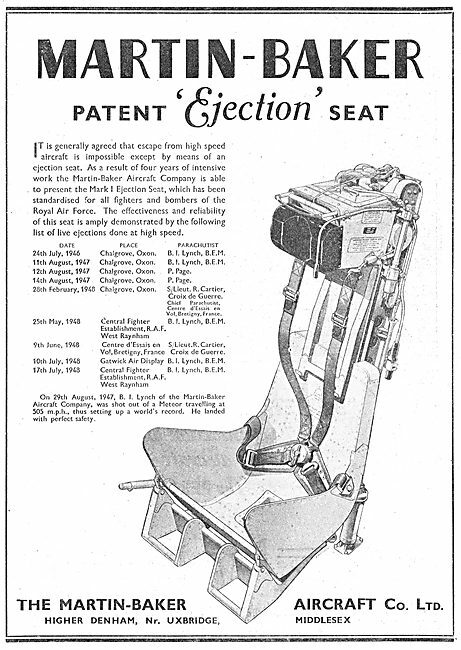 This legacy article featured in the first aviation adverts series on this domain. It’s neither comprehensive nor recently revised, but visitors to aviation museums might enjoy identifying seemingly anonymous looking markings on the exhibits. Symbols and markings are marked on the airframe or on the outside of access doors or panels as a guide to the servicing point covered by the door or panel. Units of pressure are specified in both metric and Anglo-American systems, i.e. , kgms/sq.cm. and lb/sq.in. The N.A.T.O. code number of the material in the supply circuit, where appropriate, is also indicated. SERVICING MARKINGS – Nominal colour-Black on light background, or white on dark background. 1. Fuelling Four-pointed star with NATO code for grade of fuel. 2. Rocket Fuels Four-pointed star in crescent with NATO code (if applicable) or name of fuel. 3. Rocket Oxidisers Crescent with type of oxidant (NATO code when allocated). 4. Engine Lubricating Oil Square with NATO code for type of lubricant. 5. Hydraulic Fluid Circle with NATO code for type of fluid. 6. De-icing Triangle with NATO code for grade. 7. Coolant Two horizontal S’s with NATO code for coolant and, if necessary, percentage composition. 8. Pneumatic System An “X” with maximum charging pressure. 9. Oxygen (Breathing) Two horizontal rectangles with filling pressure, or “liquid” and transfer pressure. 10. Anti-detonant or Thrust Augmentation A chevron with NATO code and percentage composition. 11. Air Conditioning Four dot pattern. Square, less a quarter-arc at each corner with type of gas and filling pressure. 12. Inerting System Square, less a quarter-arc at each corner with type of gas and filling pressure. 13. Fire Extinguishing System A diamond and name of extinguishant. 14. External Electrical Connections An “E” with lower limb shortened stating service and voltage details. 15. Ground or Earthing Point An inverted “T” with two bars beneath, each of shorter length, with notation shown. 1. Jacking Point Square with two slanting legs; yellow colour. 2. Slinging or Hoisting Point Hook on horizontal bar; yellow colour. .
3. Picketing Point Anchor; yellow colour. 1. Explosive Actuated Devices Red equilateral triangle, apex down, bearing the words “CANOPY”, “EJECTION SEAT”, etc., in white and the word “DANGER” in red on each side of the triangle; applied on the adjacent external part of the airframe on both sides of the aircraft. 2. Break-in Points The words “CUT HERE FOR EMERGENCY RESCUE” are marked on the outside of selected areas of the fuselage and encircled by a broken line. These markings indicate where personnel could cut into the fuselage and encounter the minimum of obstruction; the markings are coloured yellow. 3. Emergency Equipment When an aircraft carries emergency equipment which is easily accessible from the outside, their positions are shown externally by stencilled words. coloured red, e.g. AXE STOWED HERE. In addition, the position of the equipment may be further shown by a full size red coloured silhouette of the item on the outside of the fuselage in a position corresponding to the exact stowage position inside. 4. Normal Entrance Doors and Exits – The controls for normal operation of entrance doors and exits are marked, and operating instructions applied in the immediate vicinity; the markings are in yellow. 5. First-Aid Kit The location of the first-aid kit that can be reached from the outside is marked with a red cross on a white background adjacent to the access panel or exit. 6. 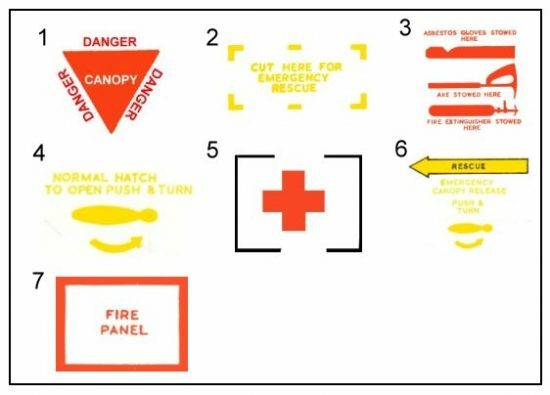 Emergency Canopy Release The location of the emergency canopy or hatch release control is indicated by a yellow coloured arrow with a black border and inscribed with the word RESCUE in black. Operating instructions are marked in yellow. 7. Fire Access Panels The fire access panels on the engine cowling are marked with the words FIRE PANEL in red, inside a red rectangle. 2. Ejection Seat Firing Handle The centre portion of the ejection seat firing handle is striped yellow and black, and the sides are painted red. The words “DO NOT PULL HANDLE” are painted in red on the head rest.